A very well thought out custom layout makes this a special Hatteras M/Y. This 78' Hatteras has been through constant major updates making her one of the nicest, most customized Hatteras of her size today. With her large aft deck with full stairs to the flybridge, expanded master stateroom with his and hers and Jacuzzi, huge walk in closet, private stairs from the salon, walk through engine room, amidships VIP, additional crew forward, new galley with granite floors, recent bright white paint job, re-done window frames, new carpeting, new interior,freshly rebuilt engines in 2015, new headliner and valances, this one of akind verycustom Hatteras is the best deal in her class today. She is totally loaded in ready to go"turn key status". Priced for immediate sale. United Yacht Sales New Jersey would love to guide you through a personal showing of this 78' Hatteras Cockpit Motor Yacht 1987. 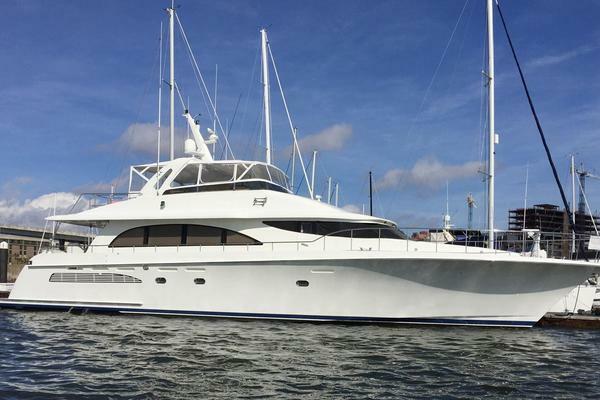 This yacht for sale is located in Myrtle Beach, South Carolina and priced at $549,000. For a showing please contact us by filling out the form on this page and we will get back to you shortly! ThisCustom78' Hatteras sleeps 10 in 5 staterooms!!!. The extended custommaster with his / hers heads and Jacuzzi isaft. The VIP hasqueen berth is amidships and can be accessed by the walk through engine room or from forward. Thethird stateroom is up and to starboard, the fourth is up to port (crew)and the fifth is upper lower twinsforward. This is a one of a kind totally custom interior created by AMT (Marinemax Hatteras Dania) when the yacht was only 4 years old in 1991 to create whas is now today a "standard desired layout" on newer Hatteras with the exception that the Master on this 78 Hatteras is the largest in her class with His and Hers / Jacuzzi, and huge walk in closet with separate stairs to the salon and walk through engine room.Over $1 million has been spent over the past 10 years keeping this one of a kind 78 Hatteras above the rest and her initial redesign cost over $900,000 in 1991-1992. This expansive 5th stateroom layout also is enhanced by an extra large aft deck with molded stairs to the huge FB, aft deck controls,and a functional full fishing cockpit with hot and cold shower, built in tackle storage, and extended fuel tankage. Thevery large salonfeatures a cream colored L-shaped Natuzzi leather couch with large cherry wood coffee table to port side upon entering from the aft deck. To starboard is a small built in wet bar sink with marble top. Moving forward is a cutom stairway leading to the master stateroom and engine room. Forward of that on the starboard is the large entertainmentcenter which holds a pioneer CLD 1030 CD video system, YAMAHA K420 cassette player and Adcom CFS six speaker selector for the surround sound. A custom cabinet provides storage and holds a pioneer CD player, Yamaha receiver, a 52" Element TV and a RCA direct TV satellite system with a modulator to all televisions. To port is a very large dining area that seats up to 8 at a beautiful cherry dining table. To port aft of the dining are two barrel chairs with side table. The recent 2014 interior refit included headliner and overhead lights throughout vessel, new marble flooring in the galley, helm area, and on the wet bar sink.andnew carpet and runners throughout. Large 8' custom aft deck provides full fiberglass staircase to the flybridge which has hand rails and a large sliding hatch. On the flybridge there are handrails on the starboard side for safety when transiting the flybridge fore and aft.An opening door into the flybridge seating area makes this the preferred way to go to the flybridge when cruising, avoiding the steeper pilothouse steps. This is great for guests or kids that move from the cockpit and swim platform to the flybridge in bathing suits or just as easier flybridge access in general. There is a large teak table and teak chairs on the aft deck. Cockpit controls with thruster control make docking or light fishing much easier. The aft deck has hard sides and side windows to protect the aft deck from sea and spray. Second new boarding ladder added for direct aft deck boarding. The second guest stateroom isforward to portaccessed which is 5 steps down from the pilothouse or two steps up from the mid VIP guest and one queen with storage upper bed with drawer storageand a small en-suite head with combo stand up shower. This third guest stateroom is in the port deck access. It has one queen bed with storage under to starboard with drawers and 32" TV. There is a full hanging locker and ensuite head with full shower.Either of these two forward guest staterooms can be used for crew but this has more floor space and the larger headand therefore makes a better 3rd stateroom. The forward guest and crew areawas expanded to accommodate alounge office with library and additional privacy door which can divide the library and bow stateroom from the port and VIP stateroom, creating a small foyer at the base of the pilothouse stepswhenall doors are closed. This is ideal for large families or charter guests that want privacy from the crew. The engine room is extremely clean, awlgrip painted, and shows like a yacht should! CovingtonDetroit Diesel12V71 TI's,870 HP with ZF gears whichwere overhauled by W.W. Williams Detroit Diesel, Savanah, GA in late 2014 with warranty for $100,000! The owner wanted these engines more efficient for years of trouble free smoke free cruising. There was not a failure! Prior was afull 1999 major rebuild on the machinery. In 2000 newmuffler's and risers were installed. There is an electric fuel priming and transfer system; electric oil changing system, dual 1000 Racor fuel filters perengine, (2) spare propellers stub shaft; and the list goes on......... Updated Galley Maid head system and updated air conditioning compressors. New SMX CRUISAIRair conditioning systems2010-2014. Hull repainted in bright white for the more modern look.all black paint accent removed for the clean all white look. A complete bottom job was also done,pilothouse windows were removed and re-bedded,all systems gone through and updated. 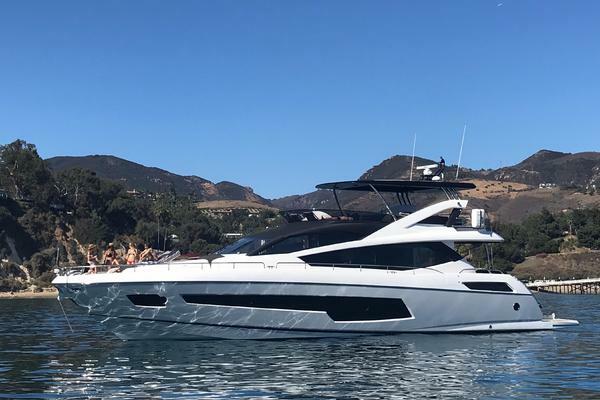 "CHRISTIE LEE"started lifeas a mint condition 68' Hatteras CKPMY and an experienced owner who could not find a Hatteras with the ideal layout purchased her and decided to rebuild her with no regard to cost. A major million dollar year long refit engineered and designed by Naval Architect Langlois & Nadeau, Inc., was completed in November 1992 at Associated Marine Technologies in Dania, Fl. --(Now Marinemax Hatteras). This complex refit enhanced the original layout significantly to modern Hatteras standards by enlarging the master stateroom and adding a his and her heads aft with center Jacuzzi tub and a very large walk in closet to port. The original guest cabin amidships has been altered to a true VIP suite. The forward crew section was expanded to accommodate two more stateroomswith privacy door. The engine room was modified toa full width, walk through engine room like todays Hatteras. The original cockpit was incorporated into the master configuration and became the large open aft deck with an extended hard top with stairway to the flybridge from the aft deck with railing and a custom entry way into the flybridge seating area. A new cockpit was added, the rudders enlarged with new stainless ones,Naiad Stabilizers addedand the entire yacht was painted in Imron. 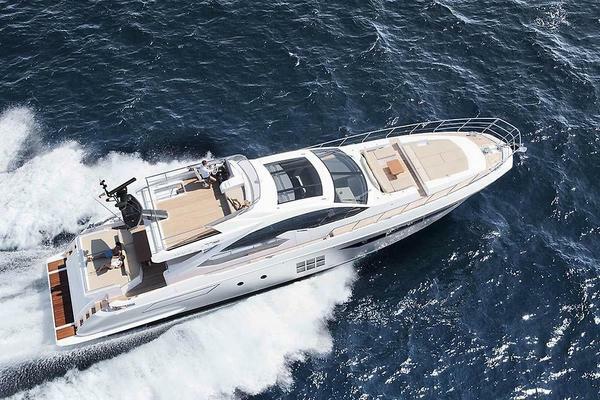 The flybridge was extended providing ample room for tenders and water toys. The cost of this year long refit was in excess of$1,000,000. Millions have been spent on her since and the current owner has her in 5t start condition. In November 2014 the engines weretotally majoredwith over $150,000 spent on mechanical andinterior workin the past year 2014-2015. Many updates Summer 2015.